Despite the interpretation some may place on the title, this is not an anti-American book. It is, in my opinion, a cogent and eminently readable argument that the geopolitical power balance in the world is now entering a new phase—one is which America is no longer the sole, reigning superpower. A few lines in the preface well summarize Zakaria’s perspective and final conclusion in this regard. The United States still plays a pivotal role in the world, but it is not what it once was. … This is not necessarily a sign of weakness or a cause for lamentations. But it is a new world in which countries will seek their own solutions and their own path, and the United States will have neither the economic means nor the political influence to impose a solution. I can’t pretend to know whether Zakaria is right or wrong. What I will find fascinating about his prediction is monitoring how much the citizens of the United States accept it if it begins to prove true. There are vocal elements in American society that have their view of economic, military, democratic and/or moral superiority built on the idea that the United States is a singularly exceptional nation that must always dominate the world. If this proves factually wrong, will this “America First” crowd be able to accept the new world Zakaria describes? It should be interesting. Zakaria says this new world is “not about the decline of America, but rather about the rise of everyone else.” But, I’m doubtful that this distinction will be noticed or accepted by those who would prefer to see threats in other countries rising in prominence. They’re so used to the concept of the zero-sum game. Will they be able to interpret China’s rise, for example, as anything else than America’s corresponding decline? Zakaria tries again and again to combat this perspective, knowing, I think, that he is likely to be misunderstood. We still think of a world in which a rising power must choose between two stark options: integrate into the Western order, or reject it, becoming a rogue nation and facing the penalties of excommunication. In fact, rising powers appear to be following a third way: entering the Western order but doing so on their own terms—thus reshaping the system itself. The world is moving from anger to indifference, from anti-Americanism to post-Americanism. Americans have a difficult time seeing the forces that are reshaping the world around them. They think they understand how the world works—some of them, in fact, are convinced God has revealed uniquely to them how the world is supposed to work—but very few of them actually have that kind of vision or wisdom. They think they’re experts but, increasingly, the rest of the world doesn’t see things that way. To foreigners, American officials seem clueless about the world they are supposed to be running. “There are two sets of conversations, one with Americans in the room and one without,” says Kishore Mahbubani, who was formerly Singapore’s foreign secretary and ambassador to the United Nations. Because Americans live in a “cocoon,” they don’t see the “sea change in attitudes towards America throughout the world. Zakaria has numerous examples of how the cocoon manifests itself in United States foreign policy. All are worth reading and understanding, but here’s a sample. Even had Iraq been a glorious success, the method of its execution would have made utterly clear the unchallenged power of the United States—and it is this exercise of unipolarity that provoked a reaction around the world. It doesn’t matter whether America’s intervention in Iraq was a success or failure. To large portions of the world, the overriding concern is how the United States took action. Too many American people and their politicians have yet to realize that they can no longer act unilaterally and expect there to be no negative repercussions. On terrorism, both [American political] parties continue to speak in language entirely designed for a domestic audience with no concern for the poisonous effect it has everywhere else. American politicians constantly and promiscuously demand, label, sanction, and condemn whole countries for myriad failings. Over the last fifteen years, the United States has placed sanctions on half the world’s population. We are the only country in the world to issue annual report cards on every other country’s behavior. Washington, D.C., has become a bubble, smug and out of touch with the world outside. Is it any wonder Zakaria predicts the United States is unprepared for a world in which it is no longer the sole, dominant player? Not that many Americans care. To them, the United States remains the world’s most indispensible nation, the one that holds the beacon that all other countries should follow. I think the thing I like best about Zakaria is the clarity of his perspective. He has the ability to slice through the bluster and indignation that drives much of our political rhetoric, and cut the legs off firmly entrenched positions with fact-based interpretations of reality. Here’s an example, in response to those who are worried that fundamentalist Islam has a chance of taking over the world as a primary governing philosophy. In contrast to Soviet socialism or even fascism in the 1930s, no society looks with admiration and envy on the fundamentalist Islamic model. On the ideological level, it presents no competition to the Western-originated model of modernity that countries across the world are embracing. You realize it’s true in as much time as it takes to read the words. Communism and fascism were the threats they were because people and governments espoused them as rational alternatives to Western secularism and capitalism. But neither of the two rising powers Zakaria profiles in depth—China and India—feel this way. Each, in their own way, has already embraced capitalism. India, especially, consciously chose its direction after observing world events. In the minds of India’s policy and intellectual elites, there was a U.S.-led capitalist model on one end of the spectrum and a Soviet-led socialist model on the other. New Delhi was trying to carve a middle way between them. In this respect, India was not unusual. Brazil, Egypt, and Indonesia—and in fact, the majority of the world—were on this middle path. But it turned out to be a road to nowhere, and this was becoming apparent to many people in these countries by the late 1970s. As they stagnated, Japan and a few other East Asian economies that had charted a quasi-capitalist course succeeded conspicuously, and the lesson started to sink in. The fact of the matter is that capitalism won the Cold War. You’d think Americans would be happy with that outcome, but I wonder how many are concerned about how well America can compete in the world that it created. Here’s another. As described earlier, Americans are sometimes oblivious to how skewed their perspective is, how fundamentally premised it is on an American view of the world around us. To speak of the “rise of Asia” misses the point. There is no such thing as Asia, which is really a Western construct. There are many very different countries that are part of that construct—China, Japan, India, Indonesia—and they harbor differences and suspicions about one another. The world looks different to China and India not simply because of who they are but also because of where they sit. The great shift taking place in the world might prove to be less about culture and more about power. There is no such thing as Asia. Brilliant. How much will you misunderstand the world if you persist in clumping competing players together into constructs that don’t exist for them? It’s a nice introduction to the next major section of his book, where Zakaria takes an in-depth look at two of the countries he mentions above—China, which he refers to as the Challenger (as in challenging America for its superpower status), and India, which he calls the Ally (as in the one with sensibilities more fundamentally aligned with our own). To me, this is the most fascinating thing about China. I’ve begun arguing for some semblance of this for the United States, as un-democratic as it may sound, because I believe we are facing some problems—a comprehensive energy policy, for one, and the ballooning national debt, for another—which will not and cannot be solved by politicians that stand for re-election every two, four or six years. We need some other mechanism for determining and setting long-term strategies. This is evident in China’s current push in higher education. Recognizing that the country needs a better-trained workforce in order to move up the economic value chain, the central government committed itself to boosting scholarships and other types of aid in 2008 to $2.7 billion, up from $240 million in 2006. Officials expanded overall government spending on education, which was a measly 2.8 percent of GDP in 2006, to 4 percent in 2010, a large portion of which is devoted to a small number of globally competitive elite institutions. Can you imagine something like that happening in the United States? Zakaria doesn’t make that comparison, but in talking about the likelihood of such action in India, he might as well be talking about America. There are certainly human rights abuses in China, but Zakaria makes what strikes me as a cogent point that one of the reasons these autocratic actions work in China is that they are, ultimately, based on reason, and not the whims of some super-rich dictator. And Chinese society, through its philosophical tradition of Confucianism, has a decided bias towards what it sees as reason. In other words, living under a dictator is bad, but there are far worse dictators than those who act based on reason and who strive for social peace. It makes for a China that, should the United States choose to view it as a threat, is a much different threat than any it has faced before. China has a military, but it typically doesn’t use it to exert its influence around the world. It works largely behind the scenes, seeking not conflicts, but the avoidance of conflict. True success, one writer Zakaria quotes says, comes from manipulating a situation so effectively that the outcome is inevitably in favor of Chinese interests. But why should this “asymmetrical strategy” be a problem for an America casting about in search of a new enemy? The United States understands how to handle a traditional military-political advance. After all, this was the nature of the Soviet threat and the Nazi rise to power. The United States has a conceptual framework as well as the tools—weapons, aid packages, alliances—with which to confront such an advance. Were China to push its weight around, anger its neighbors, and frighten the world, Washington would be able to respond with a set of effective policies that would take advantage of the natural balancing process by which Japan, India, Australia, and Vietnam—and perhaps others—would come together to limit China’s emerging power. But what if China adheres to its asymmetrical strategy? What if it gradually expands its economic ties, acts calmly and moderately, and slowly enlarges its sphere of influence, seeking only greater weight, friendship, and influence in the world? What if it slowly pushes Washington onto the sidelines in Asia, in an effort to wear out America’s patience and endurance? What if it quietly positions itself as the alternative to a hectoring and arrogant America? How will America cope with such a scenario—a kind of Cold War, but this time with a vibrant market society, with the world’s largest population, a nation that is not showcasing a hopeless model of state socialism or squandering its power in pointless military interventions? This is a new challenge for the United States, one it has not tackled before, and for which it is largely unprepared. The prospects don’t fill me with hope. Too often in our world, we see American politicians continuing to paint modern threats with the brush of the past (i.e., Saddam Hussein is the new Hitler, China is the new Soviet Union) because those are frames that Americans understand and to which America’s political and military might can be applied. But if the United States decides to fight China—and I personally don’t think it needs to—and it tries to fight on terms that don’t reflect the true nature of the conflict, how much hope does it have of winning? And what happens then? To me, this is the most fascinating thing about India. Compare that with the certainties of the Book of Genesis. This practical stoicism creates a very different kind of foreign policy. It is clear that Indians are fundamentally more comfortable with ambiguity and uncertainty than many Westerners, certainly than Anglo-Americans. Indians are not likely to view foreign policy as a crusade or to see the conversion of others to democracy as a paramount national aspiration. The Hindu mindset is to live and let live. You don’t hear much saber rattling directed at India in the United States—I don’t think most Americans think of India as any kind of military or political threat to their foreign policy intentions. But they will make interesting competitors in the global marketplace of business. You do hear a lot about the caste system that has shaped Indian society for hundreds if not thousands of years, and the growing pains their culture will have to wrestle with—violently or not—as their vast population of desperately poor and underprivileged begin making their way towards what we would think of as the middle class. It creates another interesting foil against what Zakaria sees as an opposite trend in American society, an increasing separation between our socio-economic classes. There is a growing gap between America’s worldly business elite and cosmopolitan class, on the one hand, and the majority of the American people, on the other. Without real efforts to bridge it, this divide could destroy America’s competitive edge and its political future. I found this section especially compelling, with Zakaria writing it years before, and me reading it a month after the 2012 presidential election. Much of Mitt Romney’s political message, seemed keyed towards the business elite of this country, and I think its failure to connect with the middle class is an example of the divide Zakaria is talking about. But when Zakaria talks about “the rise of the rest,” don’t assume that he is only talking about the rise of other nations like China and India. A related aspect of this new era is the diffusion of power from states to other actors. The “rest” that is rising includes many non-state actors. Groups and individuals have been empowered, and hierarchy, centralization, and control are being undermined. Functions that were once controlled by governments are now shared with international bodes like the World Trade Organization and the European Union. Nongovernmental groups are mushrooming every day on every issue in every country. Corporations and capital are moving from place to place, finding the best location in which to do business, rewarding some governments while punishing others. Terrorists like Al Qaeda, drug cartels, insurgents, and militias of all kinds are finding space to operate within the nooks and crannies of the international system. Power is shifting away from nation-states, up, down, and sideways. In such an atmosphere, the traditional applications of national power, both economic and military, have become less effective. I personally find this trend fascinating. Nation-states—and, I think, America most of all—will have a very difficult time adapting to a playing field in which non-state actors have significant power and influence. Look at the constitutional knots the United States has had to twist itself into in order to combat Al Qaeda and global terrorism. Nations will have to rewrite their own rulebooks to compete in this space, and risk alienating the base of their power—the consent of the governed—in the process. Americans are at a significant disadvantage on this front, because their identity is inexorably linked to their status as a nation-state. They go out of their way to talk about their unified vision as Americans. But many other people in the world come from cultures that have far older ways of organizing their allegiances. Zakaria cites numerous examples of religious, ethnic, and linguistic communities within nation-states that command far greater loyalty among their members than the nation-state they supposedly belong to. As these non-nation-state communities grow in power and influence, America will continue to have a difficult time understand their needs and motivations. America faces other disadvantages in this post-American world, most of them tied to perspectives that were shaped by its past. Nationalism has always perplexed Americans. When the United States involves itself abroad, it always believes that it is genuinely trying to help other countries better themselves. From the Philippines and Haiti to Vietnam and Iraq, the natives’ reaction to U.S. efforts has taken Americans by surprise. Americans take justified pride in their own country—we call it patriotism—and yet are genuinely startled when other people are proud and possessive of theirs. This strikes me as a wholly accurate description—and again it’s something that results from the view most Americans have of America as the world’s most exceptional country. Americans are raised inside a bubble of self-congratulatory superiority, and most of them come to believe that America is indispensible to the world and unfailing right in its actions. Even the history books reinforce this. Russians have long chafed at the standard narrative about World War II, in which Britain and the United States heroically defeat the forces of fascist Germany and Japan. Given mainstream U.S. historical accounts, from Stephen Ambrose to Ken Burns, Americans could be forgiven for believing that Russia played a minor part in the decisive battles against Hitler and Tojo. But are those stories true? World War II was the final nail in the coffin of British economic power. (In 1945, American GDP was ten times that of Britain.) Even then, however, Britain remained remarkably influential, at least partly because of the almost superhuman energy and ambition of Winston Churchill. When you consider that the United States was paying most of the Allies’ economic costs, and Russia was bearing most of the casualties, it took extraordinary will for Britain to remain one of the three major powers deciding the fate of the postwar world. The photographs of Roosevelt, Stalin, and Churchill at the Yalta Conference in February 1945 are somewhat misleading. There was no “big three” at Yalta. There was a “big two” plus one brilliant political entrepreneur who was able to keep himself and his country in the game, so that Britain maintained many elements of great powerdom well into the late twentieth century. Makes you wonder how much America in 2013 is like Britain in 1943—desperately losing a war and looking for powerful allies to lift the heavy burdens of victory off its shoulders so it can position itself as the kingmaker in the new world order. The problem with the comparison is that when Britain looked around in 1943, it saw Russia and America willing to help. In 2013, who will America find when it looks around for help? Or better posed, will it even look around? The issue that non-Western reformers were struggling with in the twentieth century has returned as a central question for the future: Can you be modern without being Western? How different are the two? Will international life be substantially different in a world in which the non-Western powers have enormous weight? Will these new powers have different values? Or does the process of becoming rich make us all the same? My own belief is that becoming rich makes people of different cultures similar, but not the same. All increasingly wealthy people will acquire better things and nicer places to live, but they will each bring the idiosyncrasies of their culture with them and, placing great importance on them, will leverage more and more resources for them. And some people agree with me. Think about it. Would an industrialized, urbanized, highly literate and wealthy society that rises out of one the Islamic cultures across the non-industrialized world necessarily develop any of the things Huntington mentions? And if not, how many Americans would view such a society as alien and corrupt—as anti-modern despite many of the trappings of modernization it would possess and leverage for its own cultural aims? He also recognizes the substantial benefits America has given the world. For all its abuses of power, the United States has been the creator and sustainer of the current order of open trade and democratic government—an order that has been benign and beneficial for the vast majority of humankind. 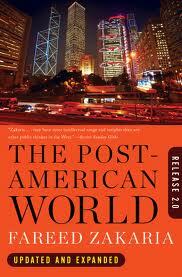 And in noting this influence that the United States has had on the world, Zakaria notes what might be its final irony. Generations from now, when historians write about these times, they might note that, in the early decades of the twenty-first century, the United States succeeded in its great and historic mission—it globalized the world. But along the way, they might write, it forgot to globalize itself. If America is to adapt to the post-American world Zakaria describes, however, there are some fundamental changes that must be made. And they may not be of the kind you would think. As it enters the twenty-first century, the United States is not fundamentally a weak economy, or a decadent society. But it has developed a highly dysfunctional politics. An antiquated and overly rigid political system to begin with—about 225 years old—has been captured by money, special interests, a sensationalist media, and ideological attack groups. The result is ceaseless, virulent debate about trivia—politics as theater—and very little substance, compromise and action. A “can-do” country is now saddled with a “do-nothing” political process, designed for partisan battle rather than problem solving. By every measure—the growth of special interests, lobbies, pork-barrel spending—the political process has become far more partisan and ineffective over the last three decades. To me, this is the essential point in understanding how to respond to the challenges that the future is bringing. America is not facing an economic crisis, nor a demographic one. It is facing a political crisis and, as such, it will require a political solution. But good luck trying to provide it from within. Those who advocate sensible solutions and compromise legislation find themselves marginalized by the party’s leadership, losing funds from special-interest groups, and being constantly attacked by their “side” on television and radio. The system provides greater incentives to stand firm and go back and tell your team that you refused to bow to the enemy. It’s great for fund-raising, but it’s terrible for governing. The political solution must come from without, not within, the current system. Is that a third party? Ultimately, I think not. Although a credible third party may open up some new thinking on some of America’s entrenched problems, it will inevitably become as corrupt as the other two and, if successful, would likely supplant one and return the system to two-party rule. I don’t know how to do it, but somehow we have to decouple some of the momentous decisions that must be made from the political process itself. Not because we think our current politics will make the wrong decision—but because our current politics refuses to make any decision at all. Let’s end with some of Zakaria’s most thought-provoking questions. The real test for the United States is political—and it rests not just with America at large but with Washington in particular. Can Washington adjust and adapt to a world in which others have moved up? Can it respond to shifts in economic and political power? This challenge is even more difficult in foreign policy than in domestic policy. Can Washington truly embrace a world with a diversity of voices and viewpoints? Can it thrive in a world it cannot dominate?